I know I'm a bit late with the times this year, but I love awards season so much that I still wanted to add my thoughts on this years Golden Globes. 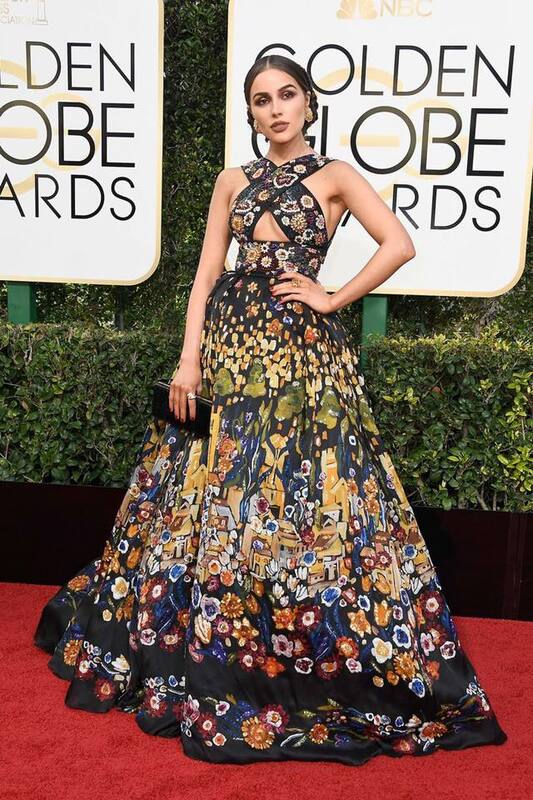 There were so many fabulous ladies and some absolutely fabulous outfits gracing the red carpet this year. There are the 4 looks that I have completely fallen in love with. This outfit is absolutely stunning, I love the simplicity of the colour scheme which is made edgy through the patterning. The loose waves and smokey eye ties into the edgy elegance look that Drew does so well. This entire look is jaw droppingly amazing. I love the subtly smokey makeup and slicked back hair, with such a statement look it really keeps attention on the pure beauty of the dress. The embroidery is so on trend and the crisscross gap showing the sternum adds a bit of sexiness, whilst keeping it incredibly classy. I love Sarah Jessica Parker's ode to Carrie Fisher with this stunning Princess Leia-esque look. Sarah never fails to look stunning and the Vera Wang gown is a thing of beauty. I don't know if this was a deliberate tribute to Carrie Fisher by SJP, but I'm sure all us Star Wars fans appreciated it nonetheless. 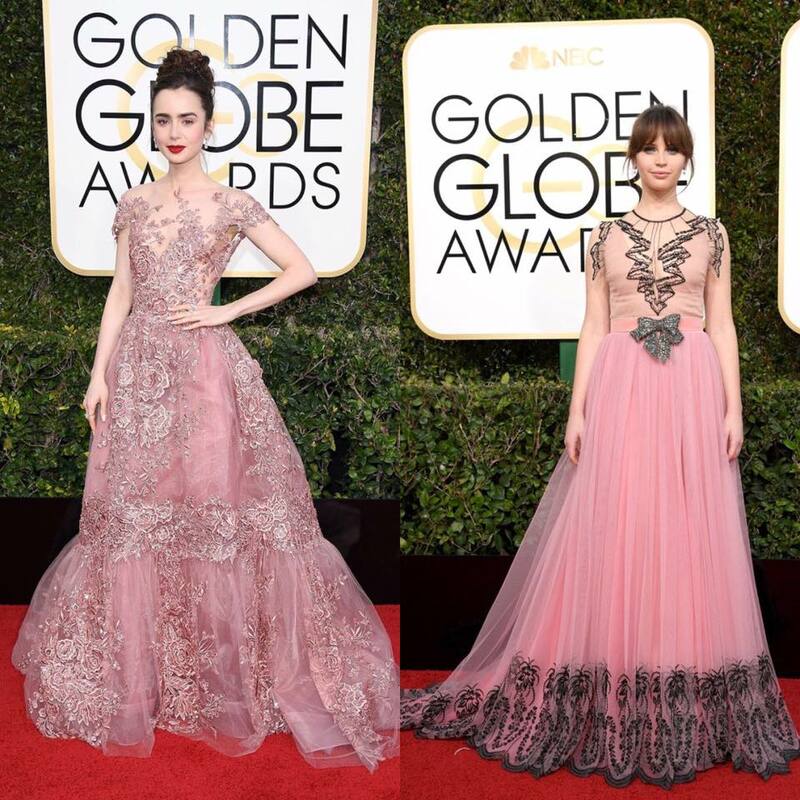 I have two favourite looks from the night and they both come in the form of two beautiful pink gowns, worn by two incredibly talented, fabulous brunette ladies. 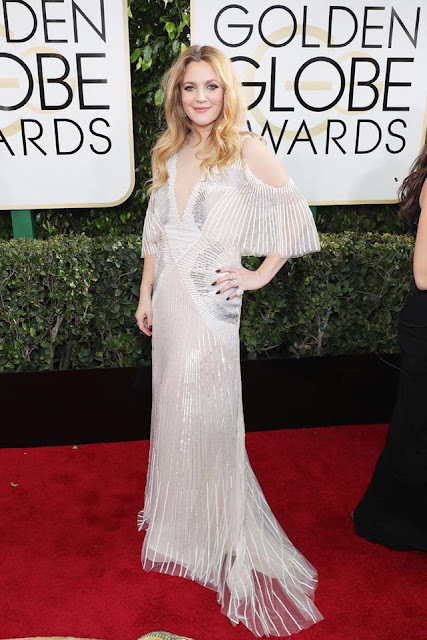 Lily absolutely killed the red carpet in this stunning dusty pink embellished number by Zuhair Murad; who is in fact becoming one of my favourite designers. It looks beautiful paired with a statement red lip and an elegant up-do and suits her pale complexion so well. Felicity Jones is quickly becoming one of my top girl crushes, and this gorgeous outfit is definitely helping to seal the deal. I love her fairly laid back hair and makeup, because with a dress like this not much else is needed to create a statement. I love how the black details contrasts the pink, it adds a little something extra to the look by giving it a bit of an edge. I would be a very happy girl indeed if this Gucci dress managed to find it's way into my wardrobe. Considering that I am very much a monochrome girl myself, I am very surprised that my two favourite outfits both come in the form of pink gowns. Of course it would be rude to talk about how fabulous the ladies look without giving a shout out to the fellas who looked incredibly dapper too. Most fabulous couple of the year award goes to Blake Lively and Ryan Reynolds, as well as the most beautiful couple award come to think of it. 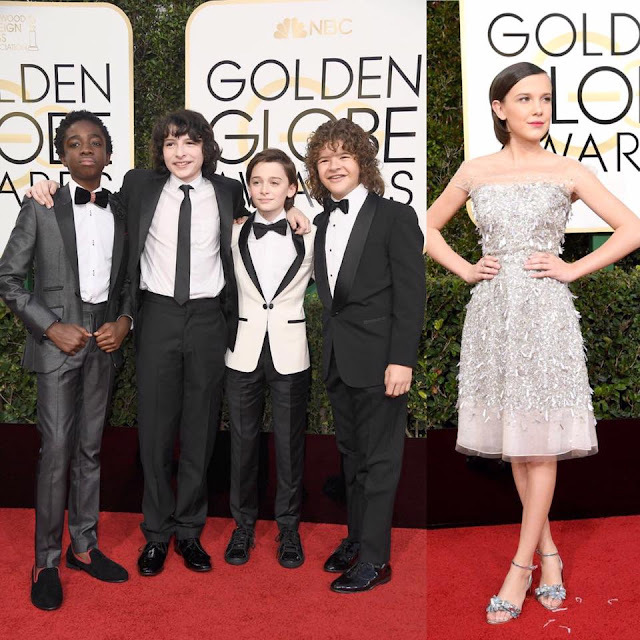 Have to add a special shout out to the Stranger Things young actors, who all looked very swish. I love the show and think they are all such talented actors, who have very bright futures ahead of them. Seriously looking forward to series 2 this year. I have to draw attention to this photo because I am completely obsessed with Rogue One: A Star Wars Story and these two's characters and onscreen chemistry. Go see the film if you haven't, it's amazing and these two are amazing; although they definitely don't look as glam in the film as they do here. I can't finish this post without talking about Meryl Streep's emotional speech, reminding us that there is more going on in the world and humanizing an event that for so many of us is worlds away. Talking about the recent American Presidential election, Meryl shares her heartbreak at the result, a feeling that many of us relate to, and expresses her desire for society to not lose it's integrity in the process of what is ahead. If she didn't already have me in tears, her closing words, a tribute to Carrie Fisher definitely pushed me over the edge. What was your favourite part of the Golden Globes 2017? Who's outfit was your favourite?